I noticed a couple of days ago what looked like mud behind her ears, now it's bloody and looks like something is eating away at her ears. She's not shedding, her hair is falling out. Help...! This is a tough question to answer without being able to see Nahla. Do you think you could get a good picture of the area? Can you tell if there is any issue inside of her ears? Do either of them look red or full of debris or smelly? If she has an ear infection then this can cause her to be scratching at her ears and may be what has caused the issue behind her ear. If you can get a photo (or more than one) you can send it to photos@askavetquestion.com. I will send you a photo now. She doesn't have anything in her ears, just behind them. They both look red and full of debris, doesn't smell. Would a hot spot cause hair to fall out? She's losing a lot of hair. What is sarcopic mange? aaaahhh, I'm scared she has that. 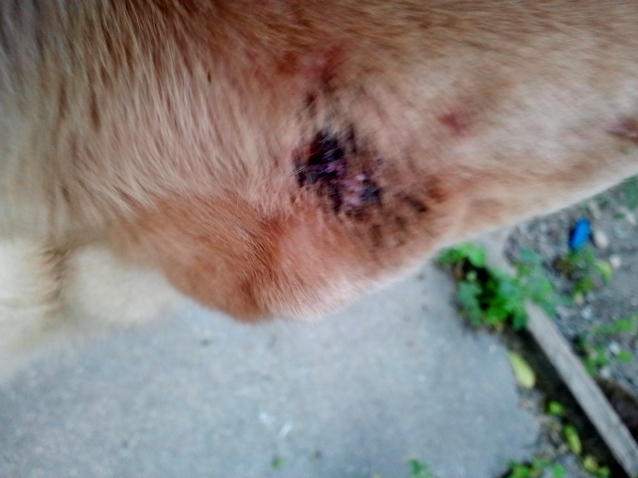 From the photos it looks like the scabs / bleeding area is really on the top of the ear. I still can't say for certain what this is, but I can give you some of my thoughts. I have seen dogs look like this because of fly bites. Do you live in a warm area that has flies or mosquitos at this time of year? If so, then this could very well be what is causing this. Sarcoptic mange doesn't usually look quite like this. 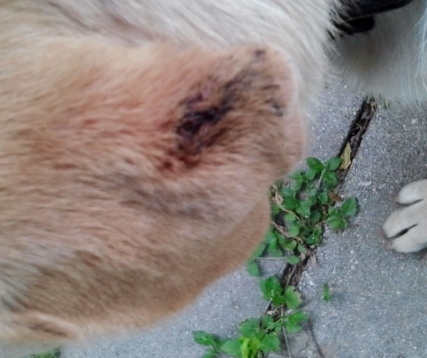 The scabs and itchy areas tend to be along the edges of the ear in a dog with mange as opposed to on top like this. If it was just one ear I would say that perhaps she has just wounded herself or possibly been bitten by another dog, but that would be very unusual to see on both ears. Another possibility, although I think this is unlikely is something called vasculitis. This is a serious immune system issue. However, it doesn't really look like that from the pictures. These really look like scabs that should soak off. You could use warm water and a tiny amount of Dawn dishsoap and a cloth and this should get the scabs off. If the skin looks really irritated underneath or if the area becomes smelly then she'll need to see the vet. If you do live in an area warm enough to see flies at this time of year then you can use a fly repellant on her. You can buy ones made for dogs such as "Bush Splash" or you can use any fly repellant that is safe for young children. Okay, what about hair loss? Is that common with fly bites? I live in San Antonio and the flies and mosquitos are very bad this year. It certainly can be. Some dogs can get something called "fly strike" that can cause hair loss and irritation on their ears as a reaction to mosquito bites. If the cleaning doesn't work then she may need some steroid or antibiotic cream prescribed by a vet.